My initial impression of the EX10 was it’s extreme quality of finish. This light is superbly constructed. There are no extraneous tool marks anywhere to be found and the anodizing is hands down the best that I have seen on any flashlight including some very high end lights I have tried. This light is covered nearly end to end in basic diamond pattern knurling. 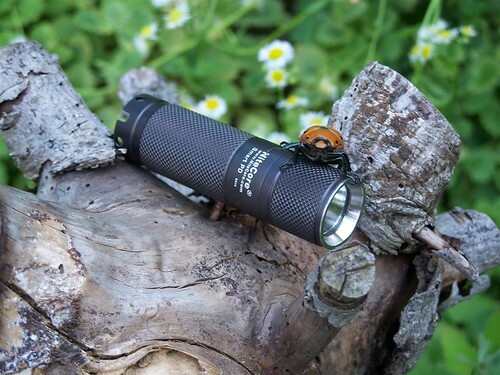 Some people are not very fond of basic knurling and I personally am of the opinion that it is somewhat overused since it is found on the vast majority of flashlights (and nearly every other cylindrical object machined out of metal), however this light seems to thrive from it. 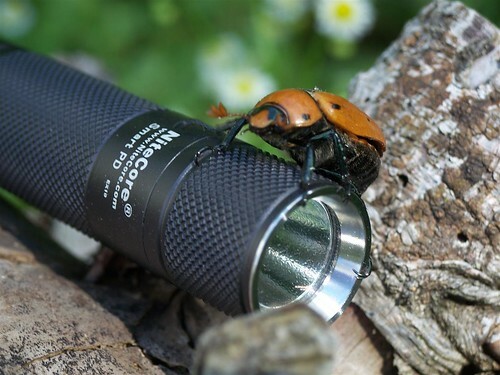 It is fairly aggressive giving a superb grip to this minuscule light. Right from the start the appearance of the nickel plated push button on the tail of the light was one of my biggest attractors. Aesthetically, the contrasting light / dark look is beautiful. Functionally the obvious tail standing ability that still allows for easy access to the switch is fantastic. Operationally the concept of the PD design is one I have thought brilliant for some time. The stainless Steel bezel ring is just one more touch of class that I think sets this light apart. I know the use of the extra bezel ring in the EX10 was likely devised as nothing more than a cost saving measure allowing Nitecore to utilize a standard reflector between several products of differing diameters, but it still adds a touch of beauty to an already good looking design. I am not going to go into a description of the operation of the light because that has been delved into in other locations to a greater detail than I feel is necessary. I was very impressed however with this light (my first ramping light) because of it’s extreme flexibility in offering the user a choice between runtime or brightness. I love the concept of choosing my own efficiency with enough power to accomplish whatever task I have at hand. This light takes a different approach to every day lighting needs than most and I think it is a refreshing change. Many lights these days are trying to impress people with their raw power, whereas Nitecore has determined that control is more useful in an every day scenario. I happen to agree. Power is nothing without control. For power though, I was able to compare it with a couple of lights that I either own or have access to and found it to be more than an adequate for them. The light runs very similar in output and overall lighting performance with the Fenix P2D and L2D as well as with the Pila GL2 with Cree LED. The beam shapes are barely different between them all with the tint of the EX10 by far being the whitest. The Pila has a slightly more concentrated hotspot whereas the Fenix’s are a little more floody. This is a good balance between them. Yet for all of it’s polish, I still have some small concerns with this light. My first light got a chance to be tested for waterproofedness almost immediately upon receipt as my area had massive thunderstorms roll through for the duration of that evening. I (being the good CPF’er that I am) immediately plunked it into a large puddle and begin trying to get a picture of it. After several unsuccessful minutes I retrieved the light and examined it for leaks to find the battery compartment bone dry. Happy with the outcome I pocketed the light for a couple of hours to watch a movie. When next I found myself pulling it out I noticed a significant layer of fog inside the window obscuring the beam. Not only that but it would refuse to completely turn off, instead emitting an extremely low level ‘glow’ from the emitter that served no purpose except to annoy me for not having a waterproof flashlight. I was able to remove the bezel and window and completely dry out the components overnight so normal usage could resume the next morning. After emailing fenix-store.com (non Fenix branded product now moved to 4sevens.com) they immediately took care of arranging for replacement of my light with no protests whatsoever. I have to say, these guys are good, the service was impeccable. Within a couple of days I had my replacement light in hand and was able to resume testing. Overall brightness differences between the two lights were indistinguishable indicating no lack of quality in the emitter or aberration in the electronics. The biggest visual difference however is my second light had a noticeably ringed beam where the first one was almost perfect. There is still a nice large spot with a smooth transition to spill as before, but this one has some ever so slight color variation and shadowing providing the usual “Cree ring circus”. Also notable is the fact that this second light has a much more noticeable “inductor whine” than my first one did. I’m not entirely certain if it is just because I am paying closer attention to it than previously or if there has actually been a volume increase between individual lights. This time around I also notice an extremely rapid clicking (almost a buzz) when the light is in standby mode (twisted on but clicked off) where the circuitry is waking up every few milliseconds to check for a button press. This does concern me somewhat due to the battery drain on an unused light, but thankfully I will be carrying this in my pocket almost all the time and use up the power on actual lighting long before the battery can self drain from standby mode. Two more small issues, when in momentary mode sometimes the light can seem to flicker somewhat (usually during a slightly wonky button press) causing it to occasionally jump to either min or max when not intended. I don’t know if this is just pure user error or if a slight design change would eliminate this. Also even though I like the concept (and the looks for the most part) of the Stainless steel bezel I am not 100% sold on the specifics of the implementation. The edges of this very thin metal ring extend beyond the diameter of the head of the light where it meets causing for a slightly rough feel. This isn’t a huge concern but I think it could have been corrected with minimal effort during manufacturing. Whether the bezel be made narrower or just thicker with a small chamfer doesn’t matter, but it could be better. All this being said, I am still left with a very positive feel for this light. I don’t have any qualms about declaring it to be my every day carry light of choice for the time being and for some time to come. I have to give a very hearty ‘Thank You’ to the person who commissioned this review. This light is very high quality for such a reasonable price point, and it gets my full recommendation. so what is the actual operation of the light? CLICK for on/off, THEN ramp to desired light output? OR is there even a clicky, and you can just ramp from off > low > high? The light actually doesn’t have a true “clicky” switch, but rather a piston drive. It functions a lot like a simple momentary electronic button where a quick press and release (kind of like a click) turns the light on and a second turns it off. When it is on, a press and hold will start the light ramping through the modes until you release it at your desired brightness. When you release it, the new level is now the memorized single mode. It really is mostly a completely variable, single mode light. It’s best to think of it that way.